Nothing Better Than Being a Dad! …I was delivering an orange to my almost-17-year old daughter at Quizno’s where she works. I stepped in, spoke, and she, as always, replied politely. She made her way to me at the front of the work counter where we talked for a minute about incidentals. Knowing she needed to get back to work, I wrapped up the conversation with an update about a future college trip we’re all taking with her. She nodded with approval, then headed back to her work area, which was about 15+ feet away across the entire back of the store. 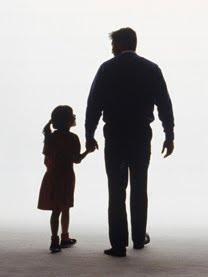 That’s when it happened – once back at her station, she turned and said to me as innocently and authentically as she did when she was 2, “Thanks, dad. Love you! See you at home.” And she said it loud enough for all the other workers to hear! Truth is, the whole store could have heard. But she didn’t mind a bit. And neither did I! Don’t misunderstand this. It’s not that those words “Love you” are rare around our house. Frankly, Bethany says them quite frequently. In fact, I don’t know if she’s ever ended a phone call with one of her parents without saying them, sometimes almost too routinely. But this time was different. It was just one of those spontaneous outbursts that grabs you and holds you spellbound for a moment. I knew she didn’t have to say it. I knew she wasn’t 2 anymore. Or even 10. I knew she was in front of her co-workers. I knew it wasn’t the culturally cool comment to make to your “old man.” I knew all that and more. But she knew all those things, too. And she still made sure I knew that I was loved. Without reservation or conditions. Clearly. Loudly. Thanks, Bethany! I love being your dad! Balancing two apparently opposite items is hard, eh? For instance, learning to discipline our children without exasperating them; figuring out how to save without hoarding and becoming greedy; understanding what it means to speak truthfully yet compassionately. And so forth! Yet, much of life is about finding balance. You know, avoiding the extremes and letting the Holy Spirit teach us how to walk in step with him. As our youth pastor and I were discussing this very issue a few weeks back regarding living one day at a time without worry (like the sparrow in Matthew) and planning ahead (like the ant in Proverbs), we humorously and spontaneously developed a name to use as we hoped to encourage each other towards this goal. In fact, since our conversation, I’ve been praying for God to turn me into this! Ready for it? “God, make me a Spant!” Yep, a Spant. It’s the fine balance between a sparrow and an ant: a creature who knows how to plan ahead yet enjoys the carefree adventure of daily trusting God for everything. Let’s be Spants today, shall we? Let’s plan and play! Let’s look ahead thoughtfully and enjoy the moment thoroughly. Let’s plan for the future and count the cost, but always with a “Lord willing” mindset (James 5), for “who knows what tomorrow may bring?” Be encouraged today as God morphs you into a Spant! Is Change the Ultimate Test? One of the clear and consistent signs of genuine salvation is change. In fact, from the Gospels to Revelation, this thread is so clearly evident that I often find it amusing that people even argue the point (Matt. 7, Matt. 13, John 6, John 10, Romans 6-7, 2 Cor. 5, Hebrews 6, Hebrews 10, 1 John 3, to name a few). Even a simple reading of the last 27 books of the Bible reveal that God’s true children, over time, are changed inside and out by him. Theologically, it is called sanctification. Street-ologically (yes, I made that word up), you’re simply different than you used to be. I say “yes” in that fruit is the sign that we have the seed of God. But the rest of the answer is where the “no” comes in to play. We have to ask ourselves, “From what source is the fruit being produced?” Like it or not, the source of change is an integral part of the answer. In Matthew 7, there was much fruit on display in the lives of the religious people; things like casting out demons, prophesying, and “mighty works.” We might even call this lifestyle an apparently changed life. But it was from a source that was unreliable. False. Plastic. Deceptive. The result? Not real change/fruit, only apparent change/fruit. Likewise, two houses are contrasted in Matthew 7. And the one that was left standing – the one that was actually real – was the one that had the right foundation. Think source. The other one? Well, it got blasted in the storm and was proven to be nothing more than false. Deceptive. Plastic. Untrue. Why? Because its source was false. Untrue. Deceptive. Essentially, the question is deeper than “Are you changed?” Quite frankly, there are many changed people. From Mormons to Buddhists to Muslims to New Agers, people all over the globe are “changing” and trying to become a better, even sometimes different, person. But the fact of change alone doesn’t tell the whole story. The fuller and deeper question is, “What is changing you?” We must at some point get to the foundational issue – the source of our change. Jesus states quite clearly that all sources other than himself – religion, effort, fear, family, sincerity, etc. – will end up as empty wells and false foundations (Matthew 7:21). They will be proven deceptive. They won’t last. Only Jesus brings change in this life and into the next (John 14:1-6). It is thus wise for each of us to ask ourselves the full question – What is bringing about change in my life? What well am I drawing my water from? What foundation am I building my house upon? What vine am I connected to? Sure, change indicates something is happening. But only when you know the source of that change can you definitively say you are being changed by God and, consequently, owned by him. This is why the Gospel matters so intensely and urgently. It is the story of the only real life-changer, Jesus. And without it, we have no hope of truly changing for the right reasons. No wonder Paul consistently points to the Gospel in his letters as the starting place for real change. He encouraged people to tell it, hear it, accept it, stand on it, confess it, cling to it, and even die for it. Which simply begs the question – does your changed life stem from the good news of Jesus Christ, the only God-man who died and rose again and is the exclusive way to God? So yes, change is fundamental, but so is the source of that change. We need to be willing to answer both aspects of this issue as we examine ourselves to see whether or not we are “in the faith” (2 Cor. 13:5). It’s a famous phrase, found not only in three of the four Gospels, but in hundreds of songs and sermons since. The phrase? “Take up your cross” (Matt. 16:24, Mark 8:34, Luke 9:23). It’s the singular call of Jesus to all who would follow. It’s non-negotiable. Cross-cultural. Mind-boggling. But he can beckon us to do so, for he bore his. And no doubt that picture brings a host of vivid – and probably negative – mental images to mind. Yes, he took up his cross. Now he asks me to take up mine. If my guess is correct, right about now you are agreeing with me, but not joyfully. And why would you (or I)? The cross is where cursed men were exposed and executed (Duet 21:23; Gal. 3:13). It’s the place of suffering. Agony. Ultimately, death. And for us to bear ours, well, that can’t be something we would look forward, right? I mean, we’ll “take it up;” after all, we have to. But “don’t expect me to do so with a smile” (we whisper under our breath). Allow me to shed some light on another angle of cross bearing. Regardless of everything else taking up our cross might mean, it for sure, and at least, means we are always close to it. You can’t bear it without being near it. Really near it. Quite frankly, you have to basically wear it. That’s pretty close! Guess what? That’s something to smile about! In fact, the closer I am – and stay – to the cross, the more like Jesus I become. So in that regard, taking up my cross is not a drudgery that I endure, but a privilege that I embrace. I get to be close to my Savior! When I consider that aspect of taking up my cross, I run there, splinters and all. Yes, it’s heavy, but it’s where Jesus is. Yes, it’s ugly. But it’s where Jesus is. Yes, it’s bloody. But it’s where Jesus is! Yes, it’s offensive. But it’s where Jesus is. Yes, it’s ruthless. Dangerous. Demanding. But it’s where Jesus is. It’s also victorious. Glorious. Powerful. Personal. Bold. Gripping. Life-saving. Life-changing. Eternal. All-sufficient. Transforming. Because it’s where Jesus is. Ah, the cross he asks me to bear is an invitation to be close to him. Really close to him. And like him. Really like him. Tell me, why would I say “no” to an offer like that?! Back in early December I posted a few snow pics under the title, "A December to Remember." Well, we're more than 60 days from that post, and it has turned into a "Winter to Remember." In fact, we're setting records each day. So far, we've been under at least 5" of snow for the longest amount of time in Iowa history, and we're in 4th place as far total snow amount in Iowa since they started keeping records. I suspect we will break the record of 72", and when we do, pics will go up! Personally, I think I've set a shoveling record for myself! I don't recall ever shoveling this much before. Have you ever felt like the odds were stacked against you? Sure you have! Maybe it was in the remaining minutes of Capture the Flag and you knew you were outnumbered, or perhaps it was in a meeting and you were “presenting your case” to many others. Regardless of the scenario, we all know what it’s like to be the underdog. Guess what? Not a single time in the OT accounts of Israel’s battles were they ever the human favorite. In fact, from what I read, they never outnumbered their opponents. Never! They were always, from an earthly perspective, “a man down.” But in each case, God was more than able to compensate. He wasn’t worried about the odds from his throne in heaven. And he still isn’t. Which is why Paul could write in Romans 8:31, “If God is for us, who can be against us?” Be encouraged today, team. With God, you are a majority. Let’s admit it – Valentine’s Day is fun, but it’s easy. Why? Because we get to “dote” on someone we love. But imagine “valentining” your enemy? That’s what I thought – No thanks! But that’s exactly what God did for us through Jesus: he loved his enemies. Allow me to make it personal – he loved me and you. Wow! Truly God’s love dwarfs whatever we know as love and his sacrifice sets the supreme example for us all. Thank our great God for his amazing and radical love today, for you are his Valentine even on the 15th! P.S. Yesterday wasn’t only Valentine’s Day, but it was also National Ferris Wheel Day (they say love makes the world go ‘round, right?). And today is National Gum Drop Day. Or, maybe for those still dating who had a bad Valentine’s experience, it is just National “Drop” Day.